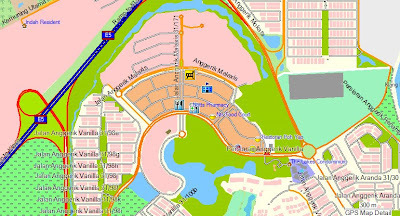 Many Malaysians and Singaporeans who use GPS know about Malsingmaps.com. It has a compiled map that consists of maps of Peninsular and East Malaysia as well as Singapore. The map used to be a free download to anyone but the forum panel has locked down the map for free usage. In other words, if anyone wants to use the latest map, he needs to contribute to the forum before he is given the unlock codes and a link to download the map. This is actually a good move to promote a give-and-take community. Somehow, GPS is not very "user friendly" or should I say "senior friendly" if one is not a tech savvy. Those senior folks have problem to log on to the forum and face difficulty even as simple as to contribute 2 POIs. Well, not all of them but at least there are already 3 seniors whom I need to help them on GPS thingy. Now, there is an alternative. Without any restriction and rule that one must contribute to acquire the latest map, you can get the latest Peninsular Malaysia and Singapore maps at Malfreemaps.com (MFM). The community was founded by the same group of GPS gurus from Malsingmaps (MSM). If you frequent MSM, you will see familiar nicks in MFM. Due to some internal politics, the gang of genuine GPS enthusiasts decided to setup MFM to continue their hobby. So what are the differences in the maps from each community? As I said above, both are free but you will need to contribute to obtain MSM's latest map whereas you are welcome to download MFM's without contribution, though you are recommended to do so. Second, there is no map for East Malaysia, namely Sabah, Sarawak and also Brunei in MFM map. So if you are from East Malaysia or if you need EM map, you have no choice but to use MSM map. Nicer? 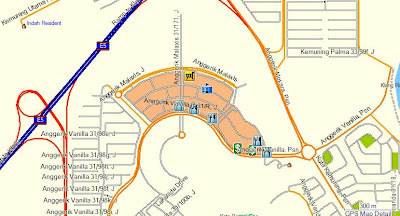 ;) Do you notice the McDonald's and Public Bank icons in MFM map? You can only see a blue fork and spoon icon and a green $ sign icon in MSM map (click to enlarge the images). Kudos to the hard works by MFM gurus together with contributions from members. So how to get the map from MFM? Read through this guide in Newbie Lounge, it's really a guide for dummies, step-by-step and screen-by-screen. One thing to note, no worries if you have no MapSource installed on your PC, just follow the steps to generate gmapsupp.img. I recommend to click NO when ask to transfer the map to your device so that your existing map is not overwritten. Once finished, go to the installed folder, typically C:\Garmin\Malfreemaps and look for gmapsupp.img. Copy it to the Garmin folder either in your device's internal ROM or the SD Card and you are done. Although contributions are not compulsory for MFM map, but since you take something, why not return something to the community? As simple as error correction and new POI are greatly welcome by MFM, if you are not an old folk like what I described above. p/s: you can also access MFM from the right panel at Daily Digest section.